Winner of four Academy Awards, including Best Picture and Best Actor, Sir Laurence Olivier's Hamlet continues to be the most compelling version of Shakespeare's beloved tragedy. Olivier is at his most inspired -- both as director and as the melancholy Dane himself -- as he breathes new life into the words of one of the world's greatest dramatists. Criterion is proud to present Hamlet in a luminous black-and-white digital transfer. Academy Awards: Won for Best Picture; Best Actor-Lawrence Olivier; Best Art Direction-Set Decoration; Best Costume Design. Nominated for Best Director; Best Supporting Actress-Jean Simmons; Best Dramatic Score-William Walten, 1949. DVD: Standard 1.33:1; audio Digital Mono; subtitles English; single sided - dual layered; 27 chapters; rated NR; 153 min. ; $29.95; street date 9/19/00. I must acknowledge that I've never been a huge fan of Shakespeare, mainly for a couple of reasons. For one, as with many people, I find the language issues to be difficult to overcome; prior experiences with Will's work simply could be too tough to understand. I also encounter the "what's the big deal?" factor. By that I mean this: since we're told from birth to death how fantastically amazing Shakespeare's work was, the frequent reaction becomes one of disappointment since the production can't live up to that kind of hype - nothing can. Nonetheless, I have enjoyed some adaptations of Shakespeare, and I must admit that the more I see, the more I like - I guess my comfort level is rising. I really enjoyed Julie Taymor's unusual take on Titus, and I also found myself surprisingly enthralled by this older version of Hamlet. It's a much more traditional presentation than Taymor's recent offering, but it works very well nonetheless. Prior to viewing this DVD, I had a lot more knowledge of Hamlet than I did for Titus. I knew very little about the latter but I'd seen at least one movie adaptation of Hamlet and may have taken in more than that. Even if I hadn't watched other versions, Hamlet is famous enough that most people have some familiarity with it, so it wouldn't be a "blind" experience. Overall, I found it to be a very strong adaptation that presents the story in a coherent and compelling manner. I'd really feared that the combination of English accents and Shakespearean dialogue would make the language impenetrable, but that was far from the truth, as I had a much easier time decoding the speech than I expected; I don't recall any times during which I encountered difficulty, and all of the language seemed to flow effortlessly. Much of that is to the credit of the performers, especially Larry himself, who I thought did a wonderful job in the lead role. In addition to the "hype" that accompanies any interpretation of Shakespeare, it's also sometimes hard to objectively judge Olivier's work. I'm too young to have seen many of his roles as they hit screens - actually, I don't think I ever saw one of his movies theatrically - but I grew up with the knowledge of his reputation as such an insanely great actor. When you have that kind of "advance word", it can be hard to live up to the recognition. Nonetheless, I was thoroughly impressed by Olivier's work in Hamlet. He covers the gamut of emotions experienced by the character deftly and smoothly; he makes Hamlet a much more believable and real person than I'd seen in prior incarnations, although he does seem to be a little long in the tooth for the role. Larry was 40 at the time, and bizarrely he cast Eileen Herlie - 13 years younger than the Big "L" - as his mother! And I thought the combination of Cary Grant and Jessie Royce Landis in North By Northwest was odd since she played his mother although she was born tenth months after him. Hamlet could drag slightly at times, but I thought it moved at a surprisingly brisk pace for a movie that runs more than two and a half hours. Believe me when I say that Shakespeare doesn't usually fly by so quickly for me; even though it should have been more compelling to me with all its battle scenes, Kenneth Branagh's Henry V went by much more slowly for me. I thought this adaptation of Hamlet brought the work to life much more vividly than I could have expected, and I thoroughly enjoyed it. 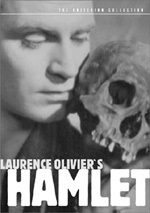 Hamlet appears in its original theatrical aspect ratio of approximately 1.33:1 on this single-sided, double-layered DVD; due to those dimensions, the image has not been enhanced for 16X9 televisions. Although the picture looks pretty solid at times, it generally shows its age and displays a fair number of problems. Sharpness is one of the image's strongest areas, as it seems nicely accurate and well-defined at almost all times. Some mild softness creeps into a few wider shots, but that problem is rare. I detected light moir� effects and a few jagged edges but nothing serious. Black levels are deep and rich, although the can be a little excessively heavy at times. I felt that dark objects tended to appear too dense and they blended into one another too easily without great differentiation. Shadow detail was fairly good, and low-light situations came across as adequately defined. Print flaws caused the majority of the DVD's concerns. Grain appears throughout almost all of the movie, and it can become quite heavy at times. A variety of other defects appear as well; I noticed scratches, hair, speckles, both horizontal and vertical lines, grit and spots. The movie can seem rather wobbly and jittery at times as well. A few scenes escape relatively unscathed, but only a few. The print issues don't ruin the experience, and I still think overall the picture deserves a "C-" because it looks good in other ways, but the defects definitely cause some concerns. Also problematic but acceptable is the monaural audio of Hamlet. Dialogue sounded reasonably clear and intelligible, though it could appear fairly rough and harsh at times. Music was thin and edgy, and effects were dull and flat. A layer of background noise appeared throughout much of the film. All in all, the quality was fairly weak, but I don't expect perfect sound from a 1948 release, and since I could understand most of the dialogue - no mean feat in any Shakespearean production - I felt the audio deserved a weak but listenable "C-". Hamlet features almost no supplemental features. We get a good essay by film critic Terrence Rafferty and that's it; no trailer, no audio commentary, no nothing! Considering that Hamlet took home the Best Picture award, I'd think it'd at least merit an audio commentary from a film historian, but unfortunately none appears here. Despite that weakness, Olivier's Hamlet merits a look. The film itself offers a surprisingly compelling retelling of the old play. It benefits from solid acting and pacing that keeps the story flowing smoothly and briskly without much "down time". The picture and sound on the DVD are flawed but acceptable, though the package includes almost no extras. Nonetheless, Hamlet deserves at least a rental; it's a fine film that I really enjoyed.